Complex polycylic structures are found in nearly every biosynthetic class of natural products. 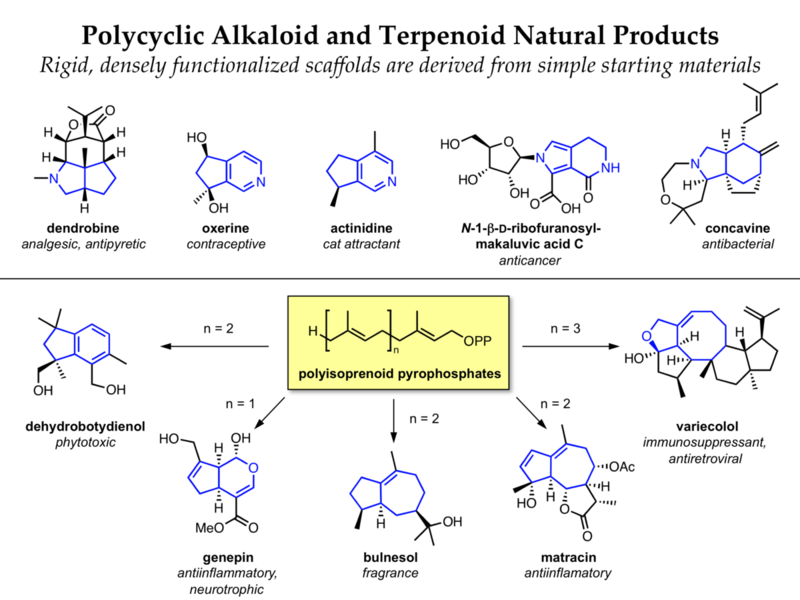 In particular, an amazing range of rigid densely functionalized polycylic compounds are formed from simple polyisoprenoid precursors during terpenoid biosynthesis. Related strategies are used in alkaloid biosynthesis, leading to diverse polycycles with nitrogen functionalities. We have developed a diversity-oriented synthesis in which multiple polycyclic scaffolds are synthesized from a small set of relatively simple starting materials. A variety of cyclization reactions are then used to generate diverse polycyclic molecules related to alkaloid and terpenoid natural products. The t-butyl sulfinamide moiety was identified as a versatile lynchpin in this synthetic approach, and solid-phase synthesis of a 190-membered multiscaffold library has been completed. Recently, in collaboration with Dr. Lisa Marcaurelle and colleagues at the Broad Institute Chemical Biology Platform, we have synthesized second-generation libraries based on these polycyclic alkaloid scaffolds that incorporate functionally diverse appendages and computational strategies for building block selection. We are currently following up upon promising hits that have been identified in screens of these libraries.